To read on about the history of Stellat’en First Nation click Here. 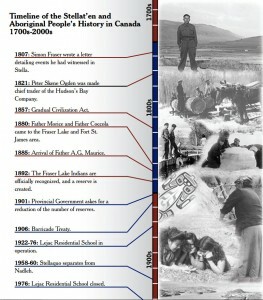 The Timeline of the Stellat’en and aboriginal Peoples history in Canada from 1700s – 2000s, from the British Royal Proclamation in 1763 which reserved undefined North American land for Aboriginal people, to 2006 when the Yekooche and Lheidli T’enneh First Nation groups signed an Agreement-in-principle. 1807 – Simon Fraser wrote a letter detailing events he had witnessed in Stella. 1821 – Peter Skene Ogden was made chief trader of the Hudson’s Bay Company. 1857 – Gradual Civilization Act. In pre contact era there was a natural cycle of life. The yearly flood plains would come and go with the weather patterns. The winters were harsh. The wild life was in abundance. There was no mystery to living healthy and surviving it was just done according to the laws of our ancestors. Father Morice suggests there were close to 39,000 carrier people living at that time. In the past carrier people were semi-nomadic. Stella may have been summer fishing station…. To learn more about Stellat’en First Nation pre-contact, click Here. Picture yourself packing up your belongings, saying goodbye to your friends and family, and leaving your home on foot to reach a destination 3,000 miles away. You then hike alone for days and days along a forest trail until you reach a familiar river. You take a short rest, and then climb into a borrowed canoe along with your gear. You canoe for days, even weeks, sleeping in make-shift shelters along the riverbank, and fishing and hunting for food between long hours of rigorous paddling. Finally, you come to a wide opening in the river where a large steamboat awaits to depart for Vancouver. You purchase a ticket, and step aboard, heaving a huge sigh of relief. At the same time, you swallow hard, and feel a mix of fear and anticipation jabbing in your stomach. You know that while the end of this journey is near, it is also just the beginning of an entirely new one…. To read more about Stellat’en First Nation War Veterans, click Here. Chief Peter Luggi: First elected Chief was the son of Jennie Ogen. He was born in 1909 and his term in office extended from 1968 to 1970.